As if I needed another dessert addiction, it seems I have found one – cheesecake bars. They are just too convenient! My favorite indulgent dessert packaged into a smaller, more portable, and slightly less guilty serving. Then, throw into the mix the classic flavor combo of graham crackers, chocolate and marshmallow – I stand no chance in resisting. I loved ’em. Another bonus was getting to use my kitchen torch. It is so fun to use and in this case, it really helped achieve the authentic campfire s’more flavor because the marshmallows rapidly caught on fire (don’t worry, I quickly blew it out!) My only change for next time will be to add a bit of sour cream to the batter to provide more creaminess that I found slightly lacking. I have indicated this in the recipe below. I already have my eye on the next type of cheesecake bars I want to try – stay tuned for that! To make the crust, preheat the oven to 350˚ F. Line an 8×8″ baking pan with foil; spray lightly with cooking spray. Combine the graham cracker crumbs, sugar and melted butter in a small bowl. Stir together with a fork until well combined. Press the mixture in an even layer into the bottom of the prepared baking pan. Bake 10 minutes; transfer to a wire rack while you prepare the filling. Reduce the oven temperature to 325˚ F.
To make the filling, place the chopped chocolate in a heatproof bowl set over a pan of simmering water. Heat until melted and smooth, stirring occasionally. Remove from the heat and let cool slightly. In the bowl of a stand mixer fitted with the paddle attachment, combine the cream cheese, sour cream and marshmallow cream. Beat on medium-high speed until smooth and well combined, 1-2 minutes. Blend in the cocoa powder, vanilla extract and eggs until incorporated. Stir in the melted chocolate until well blended. Pour the filling over the graham cracker crust and smooth the top with a spatula. Bake about 30 minutes, or until the center is just set (does not jiggle when shaken gently.) Remove from the oven. Evenly top the cheesecake layer with the mini marshmallows. 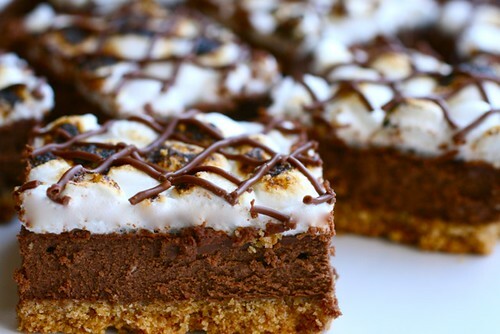 Return to the oven for 2-3 minutes, just long enough so the marshmallows begin to melt into each other. Transfer to a wire cooling rack. 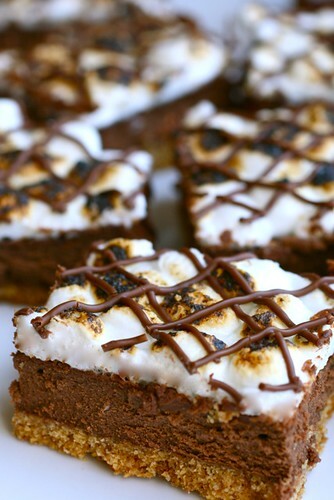 Using a kitchen torch, lightly brown the tops of the marshmallows. (Alternatively, this can be done underneath the broiler with a very watchful eye.) Once the cheesecake has cooled to room temperature, drizzle with melted milk chocolate if desired. Transfer to the refrigerator and chill 2-3 hours before slicing and serving.